Turkiye Diyanet Foundation has provided humanitarian aid to war-torn country since 2011 start of civil war. 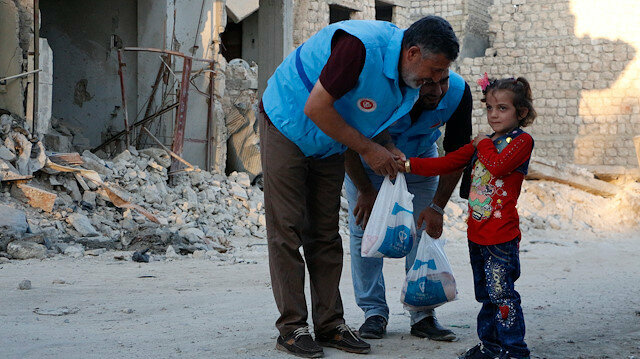 Over the last year the Turkiye Diyanet Foundation (TDV) has sent over 300 truckloads of aid to victims of the civil war in Syria, the charity group said on Friday. The aid from the group, which is tied to the state Religious Affairs Directorate, went to Syria's Idlib region and other war-torn areas liberated during Turkey's Operation Euphrates Shield and Olive Branch. The foundation opened five offices and sent 316 truckloads of aid to needy people through those offices, the group said in a statement. It also distributed 120,000 loaves of bread and provided hot meals to 15,000 people every day in 2018, the statement added. In addition, the group provides clothing to needy families through its charity stores in five different locations in Syria. Since the civil war began in 2011, the group has sent 866 truckloads of humanitarian aid, the statement said. The foundation also repaired 160 mosques and refurnished 268 others in the country, it added. The U.S.-led coalition against Daesh has started the process of withdrawing from Syria, its spokesman said on Friday.The coalition "has begun the process of our deliberate withdrawal from Syria. Out of concern for operational security, we will not discuss specific timelines, locations or troop movements," Colonel Sean Ryan said.Trump said last month he was bringing home the some 2,000 U.S. troops in Syria, saying they had succeeded in their mission to defeat Daesh and that Turkey would take over the final stages of the military campaign.A possible mission east of the Euphrates, which Turkey’s leadership has been suggesting for months, would follow two successful cross-border Turkish operations into Syria since 2016 – Operation Euphrates Shield and Operation Olive Branch – both meant to eradicate the presence of YPG/PKK and Daesh terrorists near Turkey’s borders.The PKK is listed as a terrorist organization by Turkey, the European Union and the United States. The YPG and PYD are its Syrian extensions.